I feel that I have to use a phrase from Monty Python to open this review. "And now for something completely different." Having just reviewed one of the most famous bands in the world, The Bellamy Brothers, I now find myself listening to and reviewing the latest album from Sarah MacDougall. Sarah is a new name to me and probably to a number of other people, especially on this side of the pond. However I would venture to suggest that she will not remain quite so anonymous here for much longer. Sarah is a Swedish born singer songwriter who now resides in Canada where she has won a host of awards since releasing her first album in 2009. I think I can best describe her voice as being a fusion of Kate Bush and Jewel. No bad thing! The music on this Sarah's third album is an eclectic mix of pop and folk all delivered with delightful yet understated backing. There are a number of guests on the album including the superstar that is Peggy Lee. That assumes of course that it is THE Peggy Lee! According to her website, the songs are about identity, love, fear, hope, rootlessness, growing up and forgiveness. I think it is fair to say that Sarah has all bases covered in that list even if I have never heard the word "rootlessness" before and neither has my Thesaurus. I was immediately taken with the opening track, "I want to see the light" which highlights Sarah's somewhat ethereal voice superbly even if the words are slightly dark. It is also a very catchy song which makes for an excellent opening track. For the third track, Sarah goes back to her native Sweden with "Malmo i mitt hjarta" which I have translated as "Malmo is in my heart." I think! As it is sung in Swedish I am not really sure what it is about although it sounds very soulful. 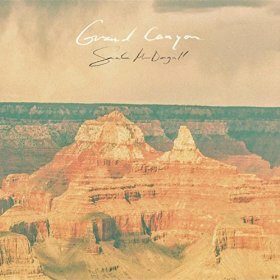 The title track "Grand Canyon" is an upbeat number suggesting that we should all go out and get drunk. I do like this lady's style. "The story of Pippi and Lionheart" must be the first song in music history to include the words Avatar, Superman and Robocop in the same song. Both clever and imaginative! My favourite track on the album is "Baby, its' only rock n'roll" which features a fabulous acoustic guitar and cello introduction and a delightful orchestral finale. The vocal is reminiscent of Duffy. The last track "2012" is a slightly cynical look at love, described as being for god dammed fools. It also rather surprisingly contains the "F" word which took me by surprise and I don't mean Folk! This lady is certainly imaginative in her choice of lyrics. I have really enjoyed listening to this rather soulful and at times sad album and it is always good to come across a hitherto unknown artist and be immediately impressed by him or her in this case. I have just one minor complaint. At 39 minutes and 8 tracks I do feel slightly cheated and definitely wanted more at the end. I know that is the aim of all encores, leave the audience wanting more. So if that was the intention, it worked for me. I want to hear much more of this talented young lady please.